Are you considering a tummy tuck? Dr. Darryl Hodgkinson of The Cosmetic & Restorative Surgery Clinic in Double Bay has the Answers. Abdominoplasty, known more commonly as a "tummy tuck," is a surgical procedure to remove excess skin and fat from the middle and lower abdomen and to tighten the muscles of the abdominal wall. 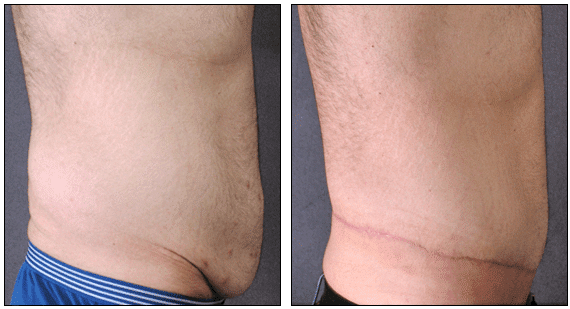 Dr. Hodgkinson has found this procedure can dramatically improve the appearance of a protruding abdomen. The best candidates for a tummy tuck are men or women who are in relatively good shape but are bothered by a large fat deposit or loose abdominal skin that won't respond to diet or exercise. The surgery is particularly helpful to women who, through pregnancy, have stretched their abdominal muscles and skin beyond the point where they can return to normal. Loss of skin elasticity in older patients, which frequently occurs with weight gain, can also be improved. If you desire to have a flatter abdomen and look more attractive in your slacks and form-fitting clothes, then a tummy tuck may be the procedure for you. Dr. Hodgkinson will meet with you in a personalized private consultation to determine if you are a good candidate for the procedure. Please contact our office to set up an appointment to meet with Dr. Hodgkinson. Complete tummy tuck surgery usually take two to three hours, depending on the extent of work required. Partial tummy tucks may take an hour or two. If a complete tummy tuck is called for, Dr. Hodgkinson will usually make anincision from hipbone to hipbone, just above the pubic area. A second incision is made to free the navel from surrounding tissue. The incision for the partial tummy tuck is shorter and usually hidden in the bikini line. The navel is not moved and the excess skin above the navel is not tightened. The skin flap is then stretched down and the extra skin is removed. A new hole is cut for the navel, which is then stitched in place. Finally, the incisions will be stitched, dressing will be applied, and a temporary tube may be inserted to drain excess fluid from the surgical site, which is easy for the patient to manage. While this procedure produces a permanent scar which is hidden by brief clothing and fades with time, many women already possess a scar from Caesarian Sections and this scar can be reused and revised. For the first few days, your abdomen will probably be swollen and you're likely to feel some pain and discomfort, which can be controlled by medication. Depending on the extent of the surgery, you may have your procedure as a day patient and spend the night at home with a support person, however for more complex cases a personal overnight nurse will be organised for you for are in your home or at a nearby hotel. Dr. Hodgkinson will give you instructions for showering and changing your dressing. And though you may not be able to stand straight at first, you should start walking as soon as possible. Surface stitches will be removed in seven to ten days, and deeper sutures are dissolvable.. The patient will be required to wear a support garment for six weeks post-operatively. It may take you weeks or months to feel like your old self again. If you start out in top physical condition with strong abdominal muscles, recovery from a tummy tuck will be much faster. Some people return to work after two weeks, while others take three or four weeks to rest and recuperate. Exercise will help you heal better. Even people who have never exercised before should begin an exercise program to reduce swelling, lower the chance of blood clots, and tone muscles. Vigorous exercise, however, should be avoided until you can do it comfortably. Tummy tucks, whether partial or complete, produce excellent results for patients with weakened abdominal muscles or excess skin. And in most cases, the results are long lasting, if you follow a balanced diet and exercise regularly and remain the same weight. Should I Get A Tummy Tuck After Having Children? Unfortunately after you have had children (especially large babies or multiple births) your stomach muscles may remain stretched, and while you can strengthen these muscles, no amount of exercise will shorten them. If you find the protuberance bothers you when wearing swimwear or fitted clothes, then a tummy tuck (abdominoplasty) can be an option to regain or even create a flat tummy. In fact, as an extra bonus with a tummy tuck the stretch marks on the skin are often also eliminated. Call us at the Clinic for details. Why is the fat on my hips, thighs and waist so hard to get rid of? Many women gain weight on their hips and thighs during their teenage years. This if often related to genetics. The main contributor to later fat deposits is hormonal including pregnancies, menopause or HRT (hormone replacement therapy). Overeating is another contributor. We encourage a healthy diet and regular exercise but this is not enough for many patients. Treatment options include liposculpture, either with a traditional procedure or the newer ultrasonic method or for patients with more sagging skin around the abdomen, a “tummy tuck” may be more suitable. In some patients, particularly those with very large amounts of fat deposits or loose and sagging skin (possibly after a large weight loss) we may suggest a thigh or body lift. The scars from these procedures are extensive but generally tolerated in order to get rid of the large amount of excessive skin that accompanies dramatic weight loss. What Can I Do About My C-Section Scar? This is very common in women who have had a caesarian section. As time goes by the low scar may widen or look crooked and accentuate any bulging over it. The “tummy tuck” procedure (abdominoplasty) can be used here too. The scar can be revised and the abdominal muscles tightened to flatten your stomach.